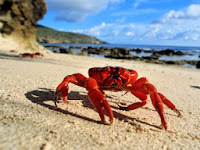 Domestic Apologist: 300-word rant: crabby and steamed. I brought home one Dungeness crab for Sean and I to share for dinner on New Year's day, celebrating both the new year and the Feast of Mary Mother of God. I love having a crab dinner as a special treat once a year; it's my little tribute to my Mom's 15-year run as chairwoman of my home parish's annual crab feed fundraiser. Before preparing the rest of our dinner I did some quick research online to see if I had to do anything else to the pre-cooked, pre-cleaned crab in my refridge. This led me to articles on how to cook live crab at home, as well as articles on whether crabs/shellfish/lobsters feel pain when they're steamed or boiled alive. “We’re behaving in an illogical way at the moment” by protecting mice but not crustaceans, he notes. Yeah. Having a thing's limbs ripped off, its scull pierced and its skin scalded while it's still quite alive (and when it's been proven, repeatably, and without question, that the thing does indeed feel pain) would never be allowed on vertebrates.